From my experiements just now, if you have a non-combat pet that has NOT been 'learned', you *can* post it using Auctioneer. 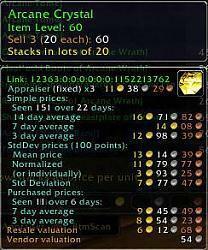 If it's been learned, or if it was assimilated into the pet journal in the conversion from 4.x to 5.x, Auctioneer refuses. I have 1 in my bags. In the appraiser window, I tell it to only sell one. (The first bar is at 1, the second bar is at 1) It tells me I don't have enough items to do that. If I check 'sell only one' it says Stack size larger than available. The pets that haven't been learned yet - and yes, I have copies of them in my pet journal, but these were bought (senegal) or found (razormaw hatchling) and not touched after that - give the 'usual' tooltip on hovering. The one caged out of my journal to sell (I have 10 albino snakes... o,O) has the pet journal tooltip. According to the forums - this one does support Battle Pets and other MoP stuff. Does anybody monitor and reply to these comments? As of today's date, Nov 2, 2012, the last reply to anyone's comment was last April. Is there a more recommended way of getting answers than posting here, and wondering if and when someone will or might reply? Thanks for any appropriate replies I might receive to both this post and the one I'm still hoping for a reply to. Ref: my post about the pop-icons that will not lose their focus properly. Mouseing-over items in AH will not lose its focus. Why? When I mouse-over any item (icon) while in the AH, the 'pop-up' picture of that item will not relinquish its focus? Sometimes, I can move my cursor way off the Auctioneer screen, and only then will the focus release the 'pop-up,' --- but, even that doesn't always work. I've had the 'pop-up' stay with my char even after quitting Auctioneer. Something is not right. Any suggestions? Why does the Appraiser not show Pets in my bags that I want to sell? ... thank you for updating this for 5.0.4 / MoP! It's just as well that you recommend removing all the files; hubby deleted my entire wow folder, addons, data files, and all, when he pulled down the new patch. I was so hoping to be able to have that sales info! Looking forward to building it anew! Re: Re: Re: Re: Re: Not matching my own price? Yes, the 'ignore user' is the whitelist, such as if you post from an alternate account and the like. Can you try doing that, adding all of your characters into the list on each machine - then see if that undercutting continues. Also, when you take a screenshot, if the odd behaviour continues, please hold Shift as you move the mouse over the item's icon in Appraiser, that will provide the complete tooltip, to help track down this oddity. Let us know of your findings. Are you posting on more machine than one? If so, it likely is not recognizing that as being from 'you'. Maybe try adding your account to the whitelist on both machines in the options. Could you please tell me where this whitelist is? I've gone through every tab in the window that opens up when I press the config button on the Auctioneer window, and found nothing called 'whitelist'. I did find something that would let me ignore a user - is that what you mean? It doesn't sound like it, but I'm unable to find anything else. My apologies for being difficult. Re: Re: Re: Re: Not matching my own price? Re: Swatter reports an error with Beancounter, where do I put it? Just copy the error - Control+A and Control+C or Command+A and Command+C within the error and then paste - Control/command V into a new comment on our forums, http://Forums.Norganna.Org . You will need an account, but that takes a matter of seconds via the 'sign in' link in the upper right and we do not use information for any nefarious purposes. That way we can help sort out whether the issue is something previously fixed/ something local - or something systemic that needs a full jira ticket. I honestly don't know how to search the forums for an error that Swatter reports, nor was I able to understand how to submit an issue on the JIRA... Where would you like this reported? it's happened a couple of times now. Re: Merging two computer's information? You would need to copy over the appropriate items in the ..\WorldofWarcraft\WTF\Account\<YourWoWAccountName>\SavedVariables, after log-out, from your 'active' machine, to the next - likely best done via a batch script of some sort, to save headaches. Copy all files beginning with Auc and also BeanCounter.lua. I play WoW both on a desktop and on a laptop. Is there some way that I can have each one have the full set of info files (auction database?) from the other? I've found that I'm missing data, at times - something I know sold, but beancounter doesn't know it. I'm assuming it's cause I checked my mail on the other computer. Re: Re: Re: Not matching my own price? As an aside, in your first sentence, when you talk about your other auctions being considered as ones you might "compete with", I just want to clarify that, for undercutting in particular, your own auctions should never be considered as competition. 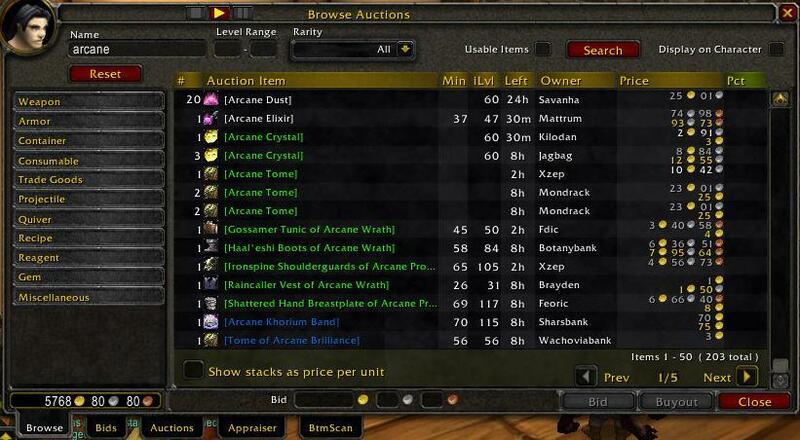 Which is to say, you should never find new auctions undercutting yourself. They should always be undercutting competitors only. Swatter reports an error with Beancounter, where do I put it? Re: Re: Not matching my own price? I think so ... it *is* confusing. In that case, I don't know that we would offer that functionality. If you're not using a fixed price, then you want the item to post based on some or all of your price statistics, and if those are changing, then your pricing probably should as well. Especially if you're also using undercutting, for which the state of the competition is extremely important in deciding how the item gets priced. You'd never want to continue posting at an earlier price if new competition has entered the market just below you, for example (or if competition has disappeared). Hm. It would seem to me that if I'm posting the same object at two different prices, I should either cancel the previous auctions (and possibly take the hit on the deposit) or wait till those auctions fail/end. It just seems rather inconsistent to me to have multiple auctions for the same object at different prices. Additionally, what if you have posted the item at two or more different prices already? Which would we pick to post the new stuff at? Well, I *wouldn't* have, if it wasn't automatically picking a different price. I'll look at this further, but I do believe it *has* offered me an 'undercut' price when I was the only person auctioning the item in question. I will specifically look for this situation again.